We believe that a bicycle and other mobility aids can make a difference in this world for reasons of health, poverty alleviation, environment, etc. The objective of Cycling out of Poverty is to improve access (availability and accessibility) to a bicycle and other mobility aids as a means for poverty reduction and initiating and promoting bicycle and mobility interventions that can contribute to improving the lives of African families. Accessibility is one of the most important factors in development. Access to schools, access to hospital and access to jobs. African women and children walk long distances every day, often carrying many kilos of firewood and water on their heads. Walking to reach schools, health facilities or areas where they can work. A bicycle and other mobility aids can break the vicious circle of poverty because it offers people in Africa the opportunity to climb (or cycle) out of poverty. 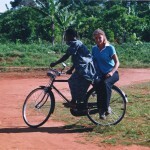 Cycling out of Poverty started after the founders Marieke de Wild and Luuk Eickmans lived in Uganda in 2004. 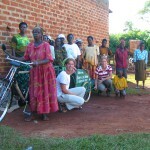 During their stay, they conducted research on the impact of bicycles on the livelihood of poor African women and their families. The results were impressive and upon return to the Netherlands they couldn’t forget about it. Under the name “Cycling out of poverty” they started small scale fundraising to support organisations in Uganda, Ghana and Burkina Faso with setting up bicycle projects. In 2007 Cycling out of Poverty was officially registered as a foundation (Chamber of Commerce no 09167973) and in 2012 it got recognised by the Central Bureau of Fundraising (CBF). In line with our strategic choice towards sustainability Cycling out of Poverty launched Cycling out of Poverty Foundation in Kenya in 2013 and Cycling out of Poverty Foundation in Uganda in 2015. Both of them are now largely donor independent if it comes to covering overhead costs due their social bicycle entreprises Bikeventures Tours and Green Hub Shop and their local fundraising efforts. 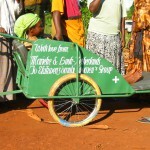 A shared responsibility for the partner organisations to raise funds created a whole new dynamic. A local identity not only opened up new funding opportunities but also created a feeling of ownership and responsibility and mobilisation of local human capacities. In 2018 we also opened doors of our fundraising affiliate in Belgium. In the near future Cycling out of Poverty wants to developed further into a strong network of organisations making a difference in this world with bicycles and other mobility aids. And in this unique way contribute to achieving the Sustainable Development Goals. According to Cycling out of Poverty every person has a right to fair and equal access to income, education, health care and food. It is unacceptable that still 1 on every 5 people lives in extreme poverty (less than € 1 per day). Also these people should have a chance to have a fair access to income opportunities, health care, education and food. We believe that a bicycle and other mobility aids can make a difference in this world and can contribute to achieving the Sustainable Development Goals. The mission of Cycling out of Poverty is to improve the livelihood of African families by making bicycles and other mobility aids accessible and available for everyone. Accessibility is one of the most important factors in development. Access to schools, access to hospital, access to jobs, access to food. A bicycle can break the vicious circle of poverty because it offers Africans the opportunity to climb (or cycle) out of poverty. 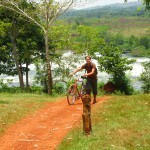 A bicycle offers an equal and fair access to income, health care, education and food for everyone. And additionally a bicycle contributes to a more sustainable society and world as an environmental and human oriented means of transport.